Everything DiSC ®Workplace is classroom training that uses online pre-work, engaging facilitation with contemporary video, and online follow-up to create a personalized learning experience. We can also deliver it in a virtual format for organizations wishing to do so. ​Participants understand and appreciate the styles of the people they work with. The result is more effective and productive working relationships. "Thought provoking, greater awareness. Great team building." ​" Highly recommend other teams do this." ​" Facilitates understanding of self and others, communication that is necessary to a functional team." "Learning about not only each others styles but what that means in a work culture in a fun and safe way"
​" Exciting, interactive and a fun way to get to know your co-workers." The Everything DiSC is usually delivered as a one-day program with teams or groups. Group size can vary from 5 to 30. ​Contact Jennifer to learn more about how the Everything DiSC can support you and your team. It is idea for teams who are forming, teams wanting to accelerate their working relationships and results, as well as teams who are looking to enhance their ability in working across differences. ​Phone us at (416)996-8326 or email us to learn more. Remove or rearrange pages, customize the profile title, or print selected sections. The profile may be used on its own or with the companion facilitation; sold separately. 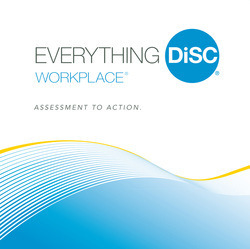 Download a brochure about the Everything DiSC® workplace Profile here. Learn more about the Everything DiSC Workplace here, or contact Jennifer at (416)996-8326 or info@potentialsrealized.com. Contact us to view a sample report. Questions or want to learn more about how you can bring this into your organization or work? Contact Jennifer Britton at (416)996-8326 or by email. In-depth: Three 90-minute modules; fully-scripted facilitation with engaging activities and workplace-focused video. Also includes 30-minute optional people-reading module. Easily Customizable: Switch out video clips. Modify the PowerPoint, Leader’s Guide, and handouts. Add or delete sections to fit any time frame. Participants learn what works for them and what challenges them when working with each DiSC® style. Participants create strategies and an action plan to overcome challenges when working with people of different DiSC® styles. Participants learn how to identify others’ DiSC® styles based on behavioral cues. Cost: $1195 US for the kit. Note that this does not include the pricing for profiles. Contact Jennifer Britton to order a Facilitator's Kit at info@potentialsrealized.com or by phone at (416)996-TEAM (8326).